Opel Monza, Vauxhall Royale, Vauxhall or Opel Senator and Carlton (including the Lotus variant). Recent additions include the Omega, Monaro, VXR8, and HSV Holdens. See Eligible Cars for a more comprehensive list. If you own, or simply have an interest in, one of the larger Vauxhall/Opel rear-wheel-drive variants then the AutobahnStormers is the Club for you and the hundreds of enthusiasts who are already members. The AutobahnStormers Club exists to preserve and promote the bigger (and hotter) Vauxhalls and Opels (including the Lotus Carlton and Lotus Omega), though with those cars becoming ever rarer it has also taken on the four-cylinder variants of the Carlton and Omega together with the V8-powered Monaro and the VXR8. 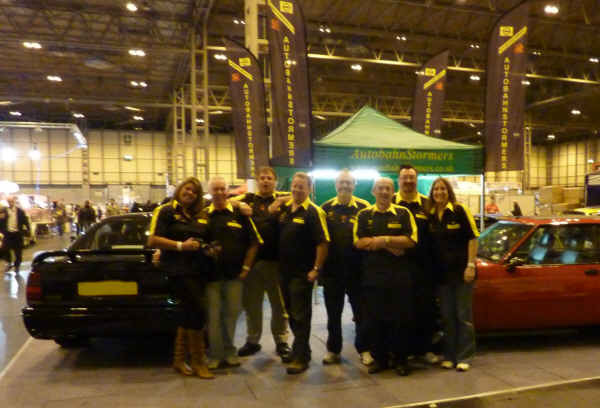 Members benefit from a members-only forum, a glossy periodic magazine, automatic membership of the Vauxhall Trade Club and access to the astonishing amount of technical expertise available from fellow members - who are always happy to help out, be it with advice on how to do a job or where to source spares. To date, there isn't a single part that members haven't been able to reproduce or substitute in order to keep their cars on the road. Add to this the many events all over the country which the Club attends each year, the monthly pub-meets and the lively social interaction and it is clear that you can't afford not to be a member!